The second wooden horse I made for my daughter was, I think, partly the result of her dissatisfaction with the first. 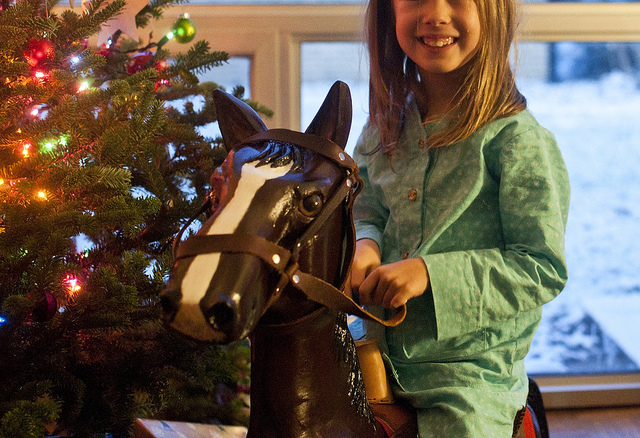 When I asked her what she wanted for Christmas this year, she said without hesitation she wanted a horse the size of "Oatmeal" that she could sit on, but one that felt more like a real horse. "You mean, like round instead of skinny and sharp? Like a Schleich horse big enough to sit on?" Once the pieces were glued together for the proper thickness, I started to carve out the details. The head and neck were done entirely with a carving knife, a couple of gouges, rasps, and sandpaper. The eyes are from a taxidermy supply website. I really struggled with getting the body into the right shape. That was definitely the hardest part of this project. I needed to use a lot of wood, but I quickly figured out that in order to make a body proportional to the head I'd already carved the whole thing would be prohibitively tall and heavy. So the body is a little smaller and skinnier than it should be, and the legs a little shorter than they should be in order to be the right height for her to sit on it comfortably. My dad really helped me shape the body with some of the amazing tools in his shop and when the horse was finally standing on four legs I bemoaned how disproportionate it was. He cheered me up by saying that give it a nice folk art quality. "Folk" is, I think, the art world's nice way of saying charmingly amateurish. I imagined a hundred years into the future and somebody buying this pony at my grandson's garage sale to try to sell to fancy New York-types as the product of a deranged turn-of-the-21st-century unemployed Detroit hillbilly. That made me feel better. After using my dad's tools for a day, going back to my knives and rasps was like going back to Kansas after seeing the lights of New York City. Still, I managed to carve out the mane and the tail in my basement and then sand out most of the imperfections in the body. 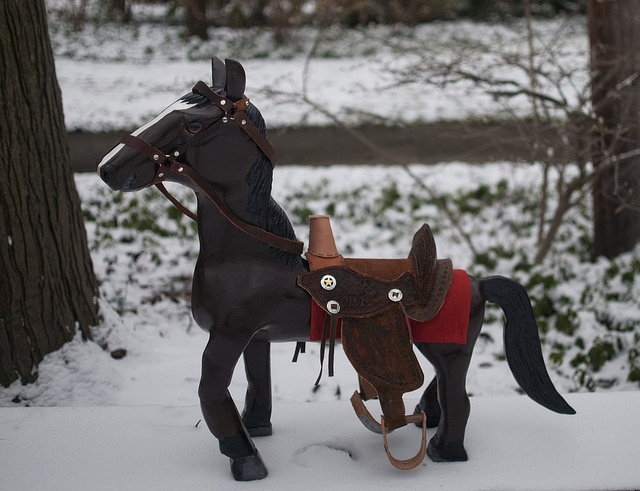 With the horse mostly carved I set to work on the leather saddle. I looked at pictures of western saddles online and got to know all the various parts. I made a scaled-down pattern and started cutting and stamping designs into the pieces. Around this time I got a complaint from my co-op board that someone was hearing hammering sounds coming from my basement. I wanted to respond: "Dear Grinches, I'm hand-tooling a leather saddle for the static wooden toy pony I just carved my daughter for Christmas." Then I realized how much that made me sound like a deranged unemployed Detroit hillbilly. Someone asked me what they thought my former co-workers at the big law firm would think if they found out I'd spent hours in my basement hand-tooling a leather saddle for the static wooden toy pony I carved my daughter for Christmas and I said they should be worried about what I think about them spending 80 hours a week going through boxes of discovery in protracted litigation over some stupid airline lease. Other than a few moments of frustration, I loved every moment of working on this gift for my daughter. I added some conchos to the saddle and real metal on the stirrups. 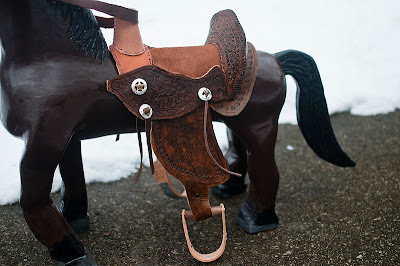 The pommel has her initials carved into the top and there's a secret message to her carved in the underside of the saddle I hope she finds one day. 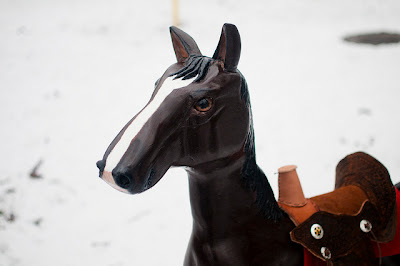 After the saddle was done I made a bridle out of the best leather I had. When that was done I painted him, which involved a lot more sanding and calls to my father for advice. I used a pre-sanding sealer, acrylic paint, and a polyurethane finish. 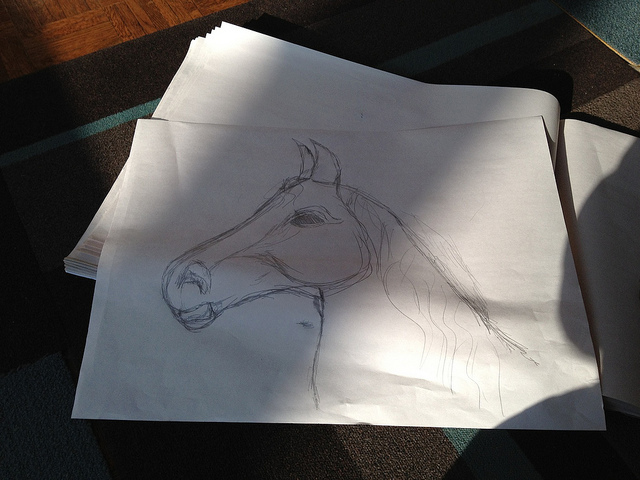 I chose to make the pony a dark bay like the horse she used to ride in her summer riding lessons. She told me she did not want her pony to have a bit in his mouth. Actually, it's supposed to be a girl pony because I refused to spend any time carving horse external horse genitalia this holiday season. I had to draw the line somewhere. She still named him Bud. I guess he's a gelding. 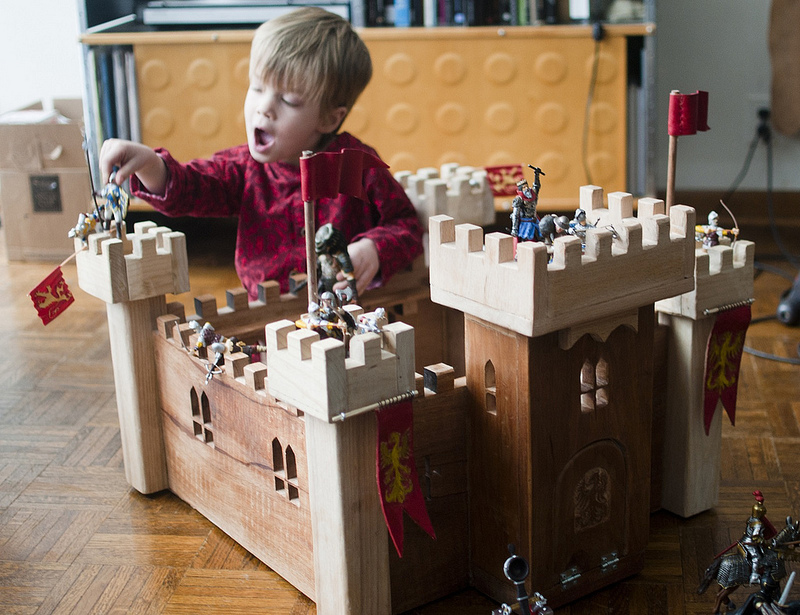 My son still loves knights and medieval stuff as much as he did last year, but because he had nowhere for all his little plastic Schleich and Papo knights to storm and defend he asked for a wooden castle. 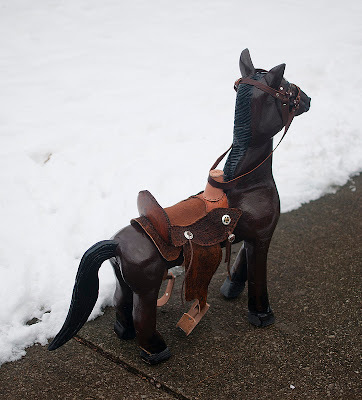 I was slogging through the hardest part of working on the pony when he told me that's what he wanted, and I almost just went out and bought him one rather than get involved in another wood project. 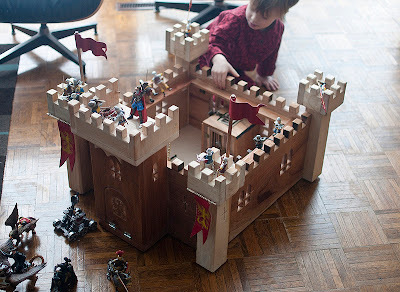 But a few days later I found a really nice long piece of ribbon mahogany for $26 and decided to stop working on the horse for a few days and build him a simple castle out of that really nice wood. 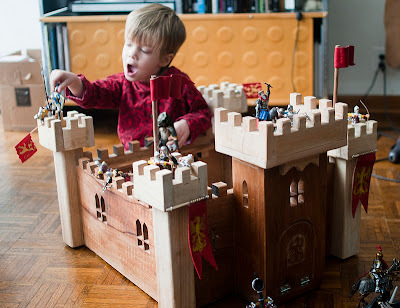 The gatehouse, drawbridge, walls, and walkways are all made from mahogany. The corner towers and the ramparts of the gatehouse are ash. The flags are 2 oz veg-tanned leather that I baked into a waving shape and dyed red. 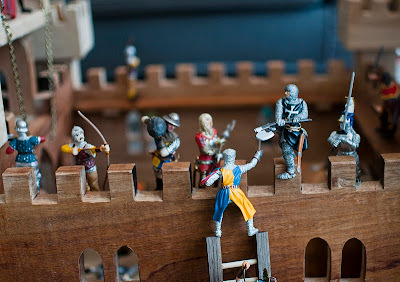 The hanging tower flags are carved with the same griffin who is carved on the front of the drawbridge, which is attached to chains that go through little pulleys so it can easily be pulled up when enemies to storm the gate. Inside the gate house there is a portcullis made from purpleheart that also goes up and down. 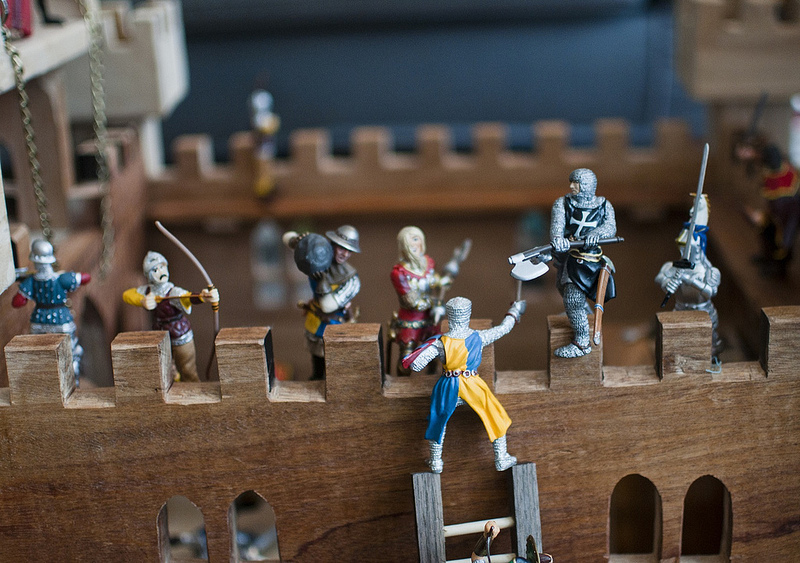 I added a few other things, like ladders for invaders to climb and a small dungeon room inside the castle. The dungeon has two doors, both made of walnut with walnut dowel bars and antique hinges. 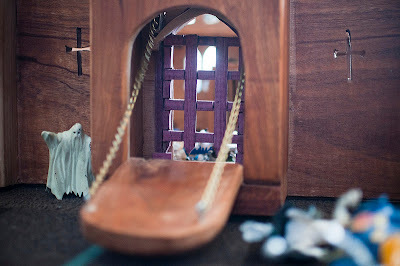 He can padlock the prisoners in when he drops them through the trap door to brood over their misdeeds. I didn't take any pictures, but the inside walls of the dungeon are lined with chains and shackles to lock up any particularly unruly prisoners. 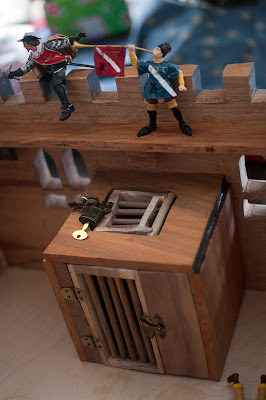 The only screws or nails in the whole castle are on the hinges attaching doorways to the wood. Everything else is just dowel joints, and it was super easy. 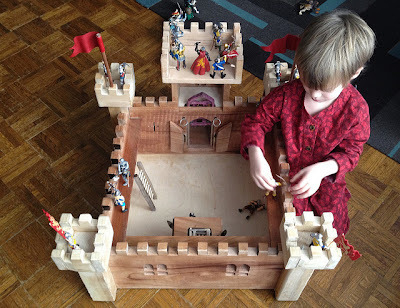 The only advantage to using a scroll saw for all the cutting on this project were the many windows (which can be cut out on a scroll saw by removing the saw blade and reattaching it through a hole drilled in the wood). Also, I think the turning radius for the crenelations was way better than if I'd used a bandsaw. Otherwise, cutting the longer straight lines required a lot of patience, and a lot of cursing. I didn't have time to completely sand and finish all the surfaces before Christmas. Right now it's completely natural, though I do want to put some kind of protective finish on it. I'll probably sneak it away for a few days once he's lost interest in it. But I don't think that's going to happen any time soon.